Where were you in July of 1987? C14, Indiana’s oldest Bald Eagle in the care of Indiana Raptor Center. 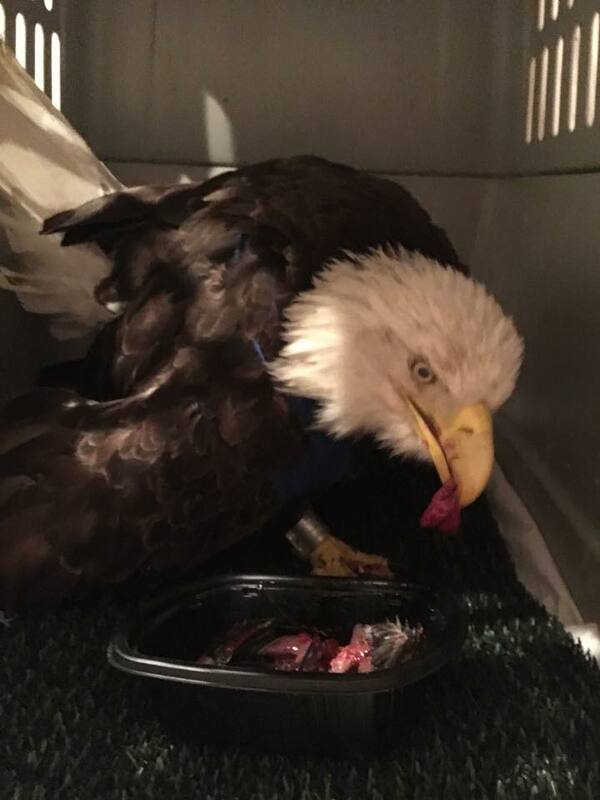 This bald eagle was being hacked, or prepared for release to the wild, in an area near Lake Monroe, Indiana. Bands have identified this eagle as C14, the oldest eagle ever recorded in Indiana at the ripe old age of 28 years, 9 months! He was banded as a youngster on July 13, 1987, during the third year of eagle reintroduction efforts by the Indiana DNR. 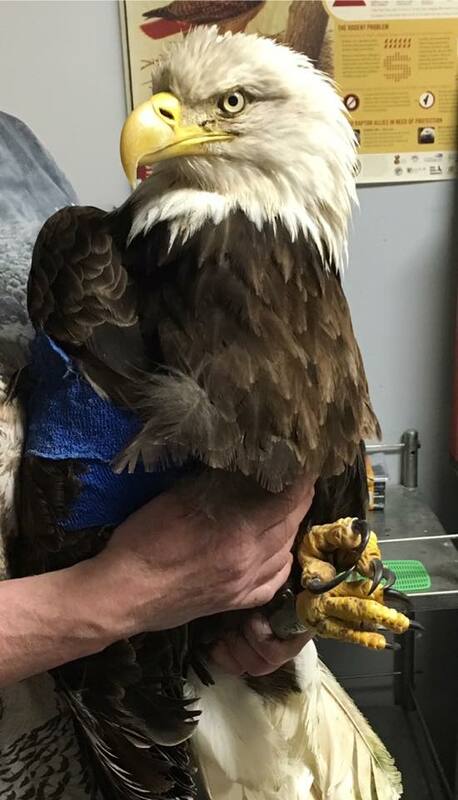 C14 was admitted to Indiana Raptor Center on Friday, April 15 after being found at the confluence of the Eel and White River grounded by a severe shoulder dislocate and resulting emaciation. Since then, he has been gaining weight. We began treatment with tube feedings, pain medications, and anti-inflammatories. We put his wing in a harness-type sling to stabilize his dislocated shoulder. We also took care to clean and top dress a few facial lacerations, as they were close to the sinus area. After a week, C14 progressed from tube feedings to whole food with little feather or fur, and we continue to monitor him closely. It is likely that C14 will not be able to be released to the wild, but as long as he is able to eat and not in pain, he will live out his days in human care. We salute this eagle for courage and intelligence to have survived so long in the wild. To think of the young he has raised, the weather he has endured, challenges from other eagles and human encroachment: it is truly a miracle! Stay tuned at our Facebook page and as ever, your help is appreciated! Your donation will go directly to caring for C14 and birds like him. Learn more about C14 from the Indiana DNR. C14, Indiana’s oldest Bald Eagle , eats a solid meal. We’re back with another look at an artist who turns her talents to the celebration of raptor-kind. This time, we meet Brenda Lyons. 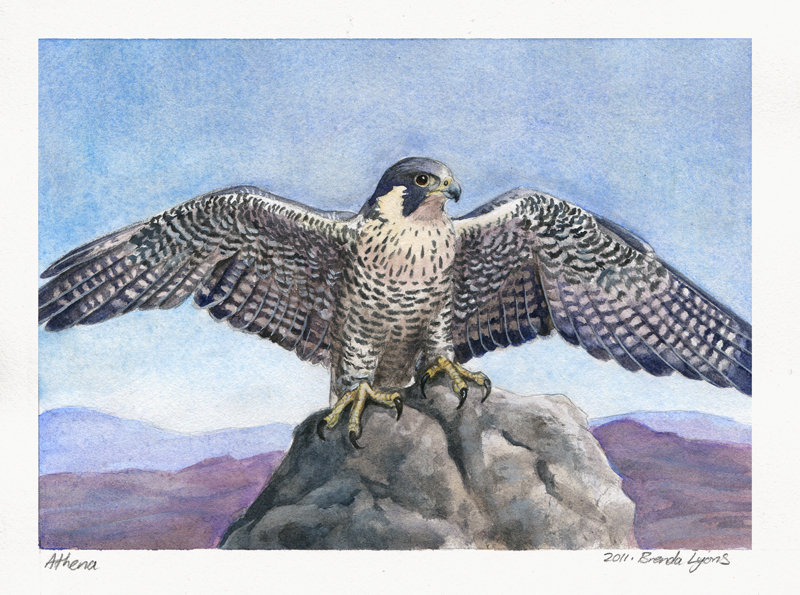 Based in Connecticut, Brenda goes by Windfalcon on DeviantArt, speaking to her great love of falcons (she even devotes an entire gallery devoted to Falcons). Her MFA thesis work at the Savannah College of Art and Design was titled An Illustrative Exploration of Birds of Prey in History and Culture. Clearly, this is an artist who is deeply inspired by birds of prey. 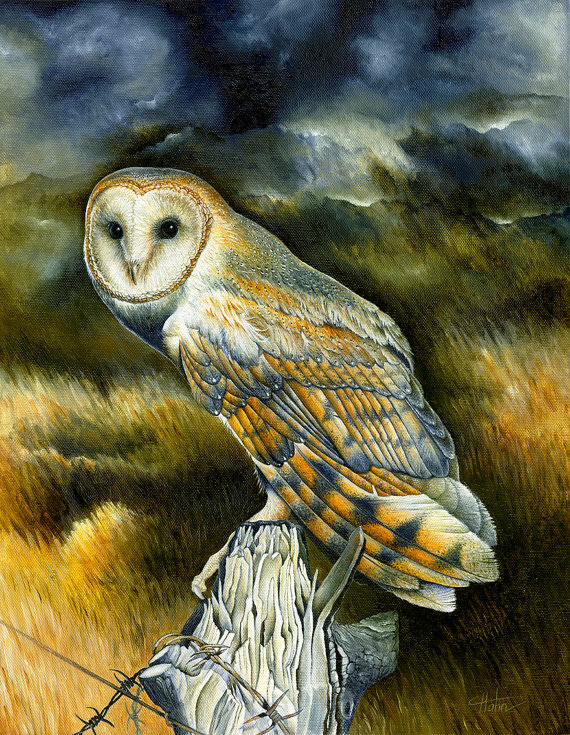 Her artwork ranges from naturalistic depictions of raptors in their environment to more mystical compositions which capture the spiritual feelings birds of prey engender in many of their admirers. She also does pieces painted directly on feathers. We hope you enjoy the following examples of her art as much as we do! 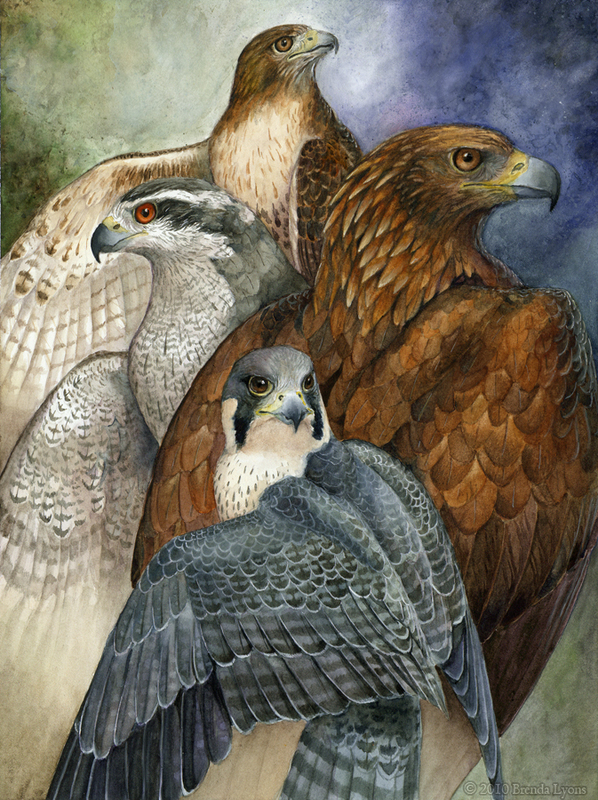 Four North American Raptors, © Brenda Lyons. Shared here with the artist’s permission. Overlook, © Brenda Lyons. Shared here with the artist’s permission. 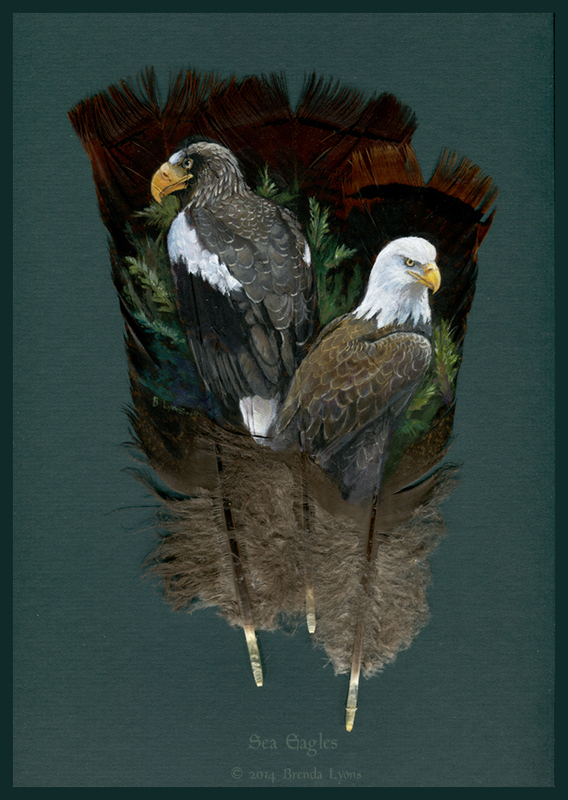 Sea Eagles, a feather painting. © Brenda Lyons. Shared here with the artist’s permission. Voice of Autumn, © Brenda Lyons. Shared here with the artist’s permission. Please follow Brenda at her website, at DeviantArt and peruse the variety of wonderful prints at DeviantArt and prints, masks, and original art for sale on Etsy. She also has written an instructional book for artists interested in illustrating winged fantasy creatures. To top all that off, she’s no stranger to raptor rehab, involved as a volunteer at Horizon Wings in Connecticut. We’d like to thank Brenda for her dedication to birds of prey, and for allowing us to put her in the spotlight here on our blog. 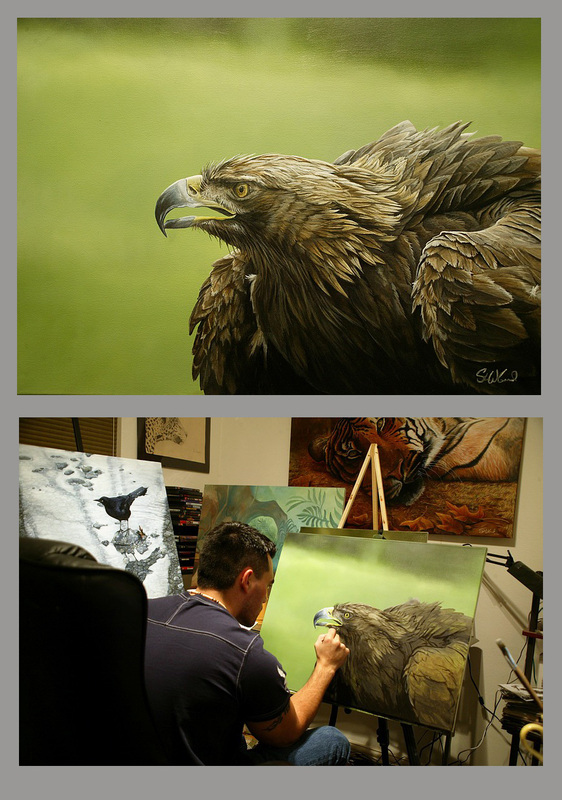 For our second post featuring beautiful raptor art, we turn our eye to Steve Goad. Hailing from Texas, Steve makes his living as a full-time artist and has worked quite a bit in the video game and publishing industries. 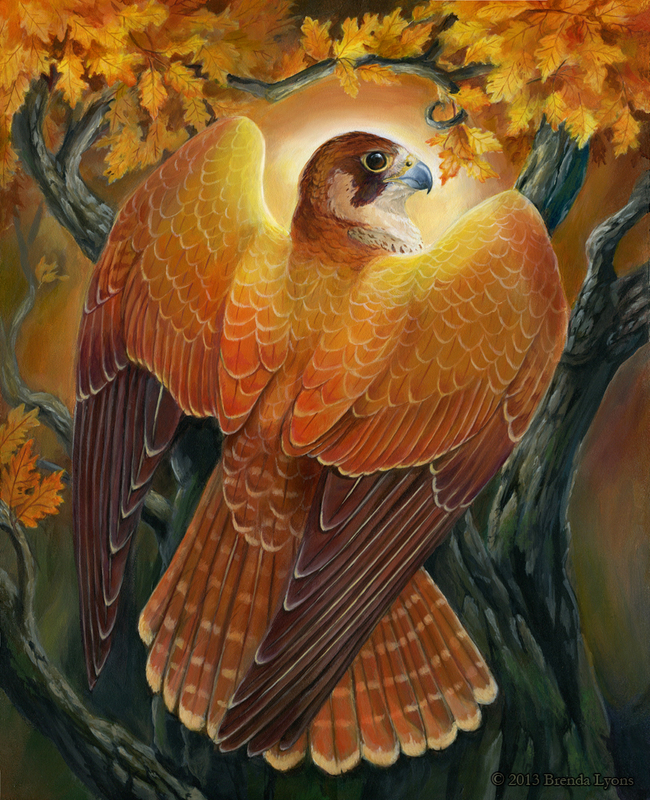 His body of work includes still life, landscapes, and charismatic renderings of comic, sci-fi, and fantasy characters, but our focus here today will be on a his lovely raptors. Red-Tailed Hawk, © Steve Goad. Shared here with the artist’s permission. Freedom Haze, © Steve Goad. Shared here with the artist’s permission. Golden Eagle portrait, © Steve Goad. Shared here with the artist’s permission. To follow Steve’s work, please like his Facebook page, follow him on DeviantArt, purchase high-quality prints at Fine Art America, and of course head over to his professional website. 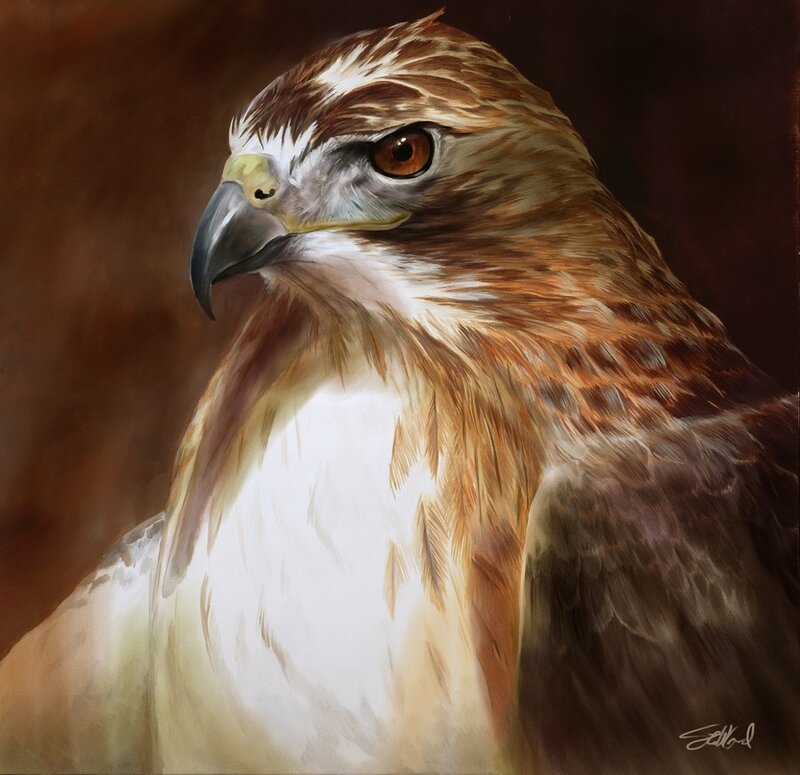 We’d like to thank Steve for allowing us to share his work here and for also bringing his artistic talents to bear in these gorgeous renderings of birds of prey. Today is Vulture Awareness Day around the world. Vultures may not be the most popular birds among the general public, but they are vital members of the environment. They are facing a range of pressures around the world, most famously from diclofenac poisoning. A few years ago, I accompanied Patti Reynolds and stalwart volunteer/ house taxidermist Markus to retrieve and injured Turkey Vulture. Her wing injury would prove to be of the sort that just can’t be fixed, but Markus, Patti, and Laura gave the bird their all in hopes of a good outcome. It is so often the case that the stresses these birds encounter before entering Indiana Raptor Center’s care prove to be too much, and the best that can be done is to provide a safe, stress-free environment for their passing. It was exciting to watch my first bird rescue. For my part, I got to hold a big net and help form a perimeter so Patti and Markus could nab her. She had not eaten recently, and therefore couldn’t manage the trademarked defense-by-repulsion method Turkey Vultures favor: good old-fashioned puke. Bird rescue and rehabilitation is a tireless occupation, with many heartbreaks along the way. Please donate to Indiana Raptor Center to help us rescue and care for these birds, and if you cannot attend our Raptor Rendezvous fundraiser on September 12, 2015, please consider purchasing a ticket for a local first responder! Please join us for the 2015 Raptor Rendezvous, the annual fundraiser for the Indiana Raptor Center Inc., to be held on September 12th at the Abe Martin Lodge in beautiful Brown County State Park. Admission to the park will be free for this event. Silent auction items will be provided by artists and merchants from the Brown County/Bloomington area. You mustt be present to win auction items. We will have presenters from 4-5 raptor rehabilitation and education centers, with 10-12 species of birds and a very special guest. Tickets are $35 and can be purchased by sending a check to Indiana Raptor Center, PO Box 1153, Nashville IN, 47448. Tickets can also be purchased using a credit card by calling 812-988-8990. Tickets will go out a few days after payment received; late purchases may be picked up at the door. There may be tickets available at the door, but don’t count on it! Order early to insure success!!! Thanks in advance for your patronage, which supports both our permanent and patient populations. Patient numbers are up this year due to the number of baby and juvenile raptors displaced by Indiana’s wet and stormy spring and summer. Please help us care for them and the balance of wildlife in Indiana, as well as for our almost 30 education ambassadors, exhibit, falconry and foster parent birds that support our public education and raptor rearing efforts. Besides – the Rendezvous is just plain FUN!! 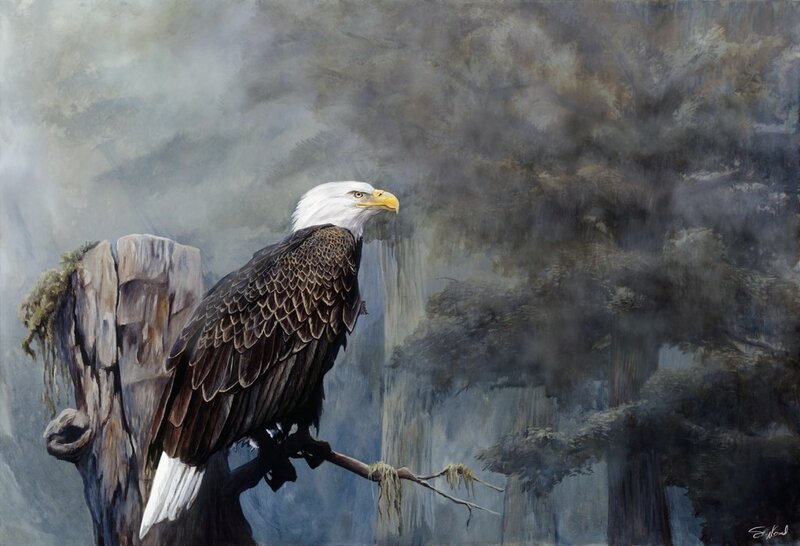 Birds of prey inspire awe in us, and that awe often finds expression in works of art. Indiana Raptor Center’s Nashville headquarters are a virtual art gallery! To celebrate our appreciation of and respect for artists who create inspiring raptor art of all sorts – from felting to mixed media to comics to illustration – we’re beginning a regular series of artist spotlights here at our new website. Illustrator Claudia Hahn has agreed to be our first subject. Claudia is a native of Germany, but now calls England home. She describes herself as “an enthusiastic fossil hunter and birdwatcher, a lover of owls,” and can even boast that she once “was the brief owner of a pet magpie.” She is especially interested in working on conservation projects, stemming from her deep appreciation of natural history. This love of the natural world comes through loud and clear in her work, as you will see in the selected pieces below. First, we’ll start with a couple of owl species we’re well-acquainted with in the midwestern United States: the Barn Owl and Barred Owl. 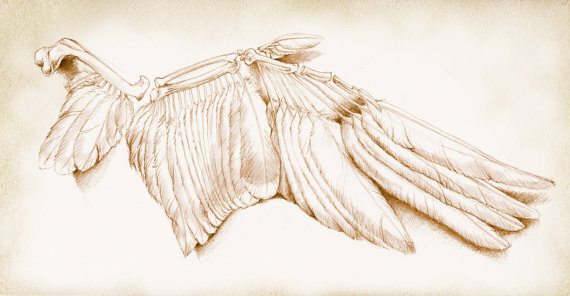 Claudia’s anatomical studies are as enchanting as her illustrations of live birds, as in this study of a wing. 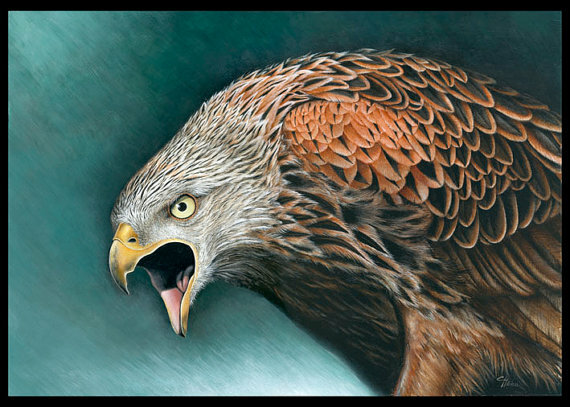 Naturally, she also focused on raptors exotic to us, as in this incredible portrait of a Red Kite. We hope you’ve enjoyed Claudia’s work and will follow her on social media: follow her at her artist website and portfolio, as well as on Twitter, Facebook, DeviantArt, and Tumblr. 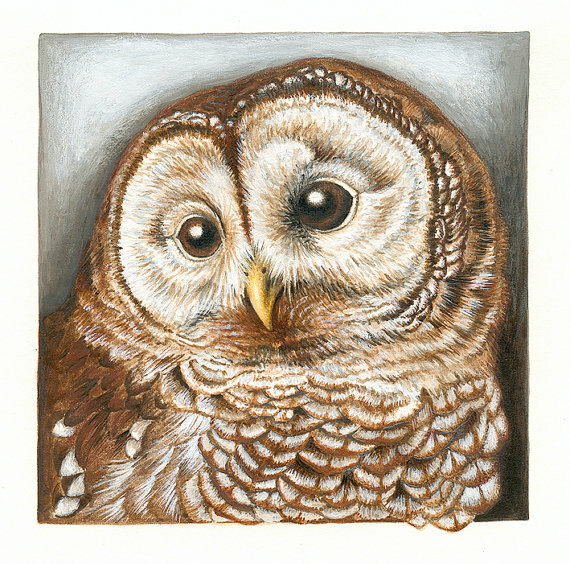 Even better, check out Claudia’s Etsy Shop where you can purchase originals and/ or prints of the works I’ve shared here and many more works that explore other facets of the natural world. All images in this post © Claudia Hahn and used with her permission. A new year and a new van! 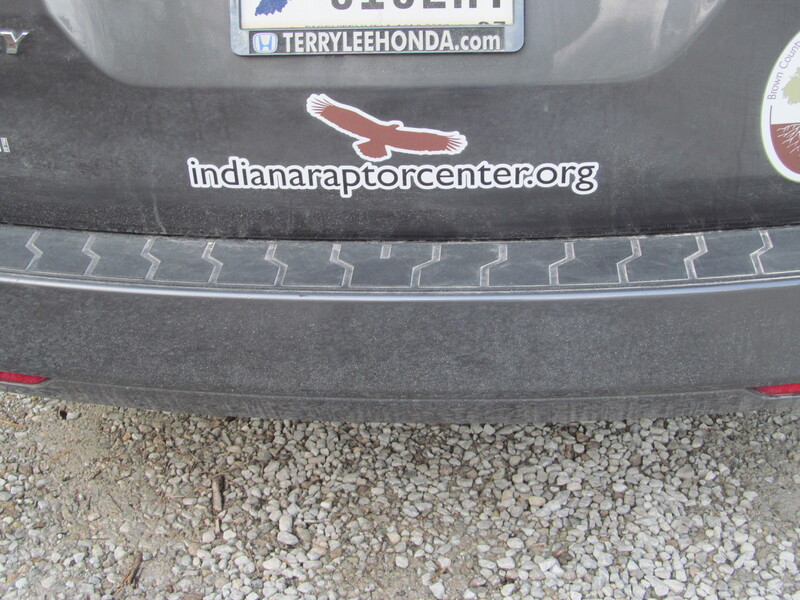 A side view of the new Indiana Raptor Center van. 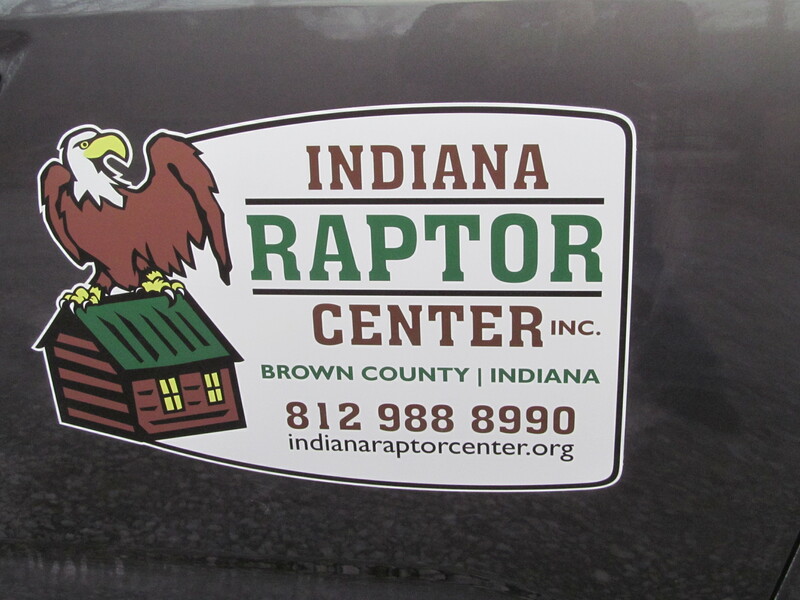 Indiana Raptor Center recently acquired a new van specifically for use by our organization. Until now, all transport for rescue, programming, and other business was carried out using the private vehicles of volunteers and board members. Some “vehicle volunteering” will continue especially in the case of rescues, as we have volunteers living all over southern and central Indiana who pick up birds for us in their local areas and bring them to the center. The new van will be used for program transportation, rescues within a 1 hour range, and other official business such as classes, meetings, and supply runs. 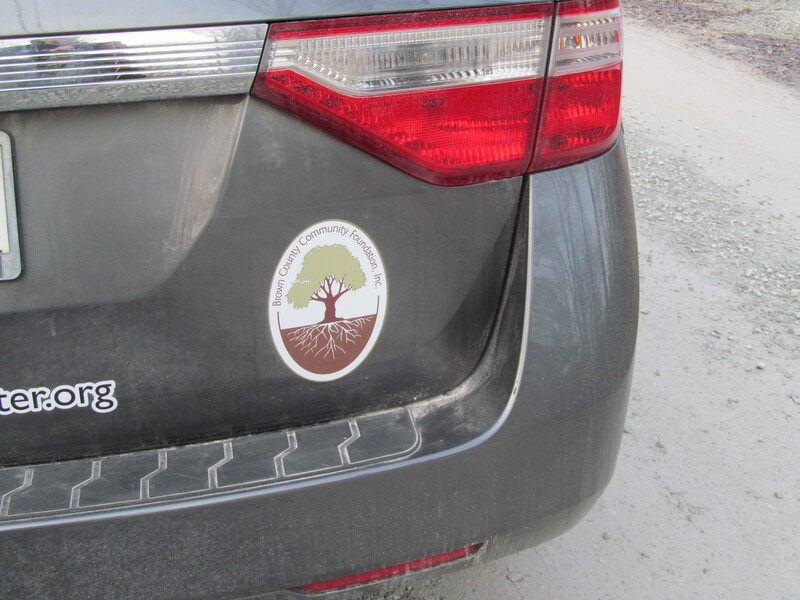 The van was purchased through a very generous $18,000 grant donation from the Brown County Community Foundation plus a gift from a private donor, and a small amount from the Indiana Raptor Center’s operating funds. The van was purchased in October 2014 from Terry Lee Honda, and was a 2012 Honda Odyssey LX with 44,000 miles on it. 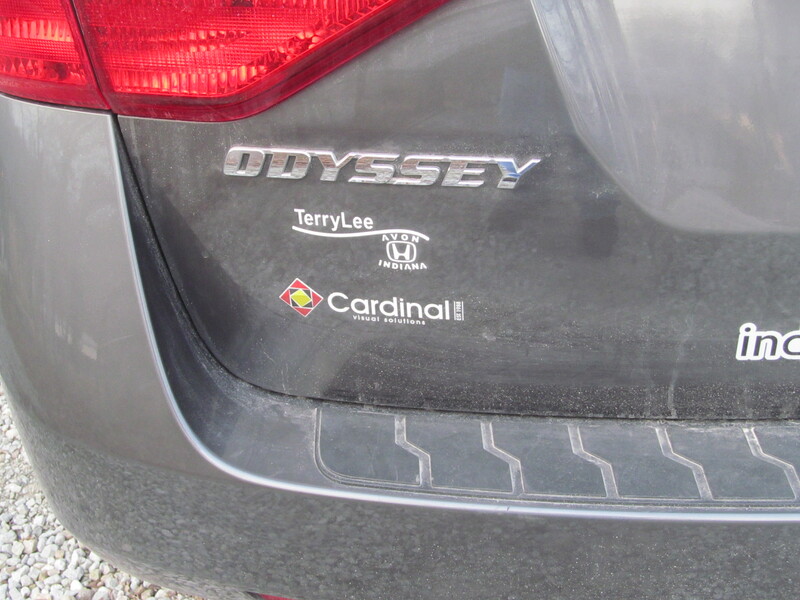 Thanks to all donors, including Terry Lee Honda for giving us a good discount on the vehicle! A host of raptors looks out from the window of our new van. A decal of the InRC logo on the side of the new van. 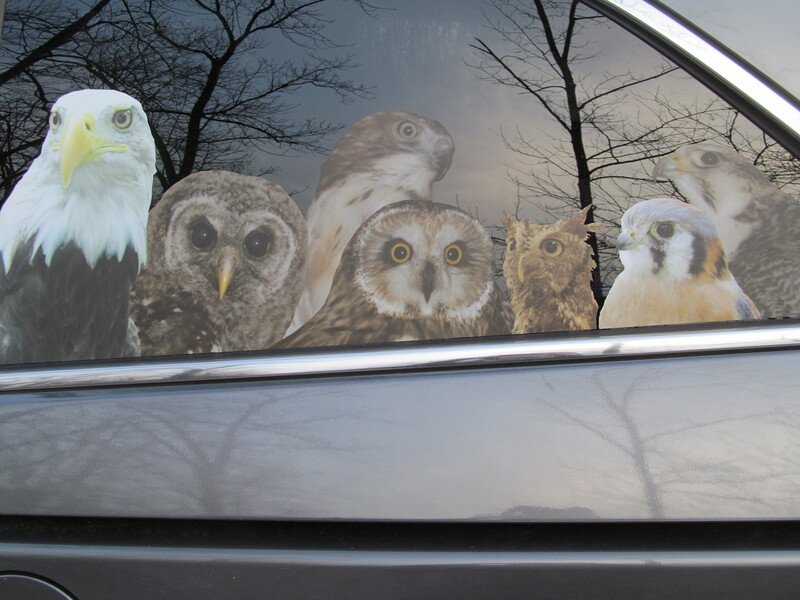 Once we had the van, it needed to be branded, not only for identification purposes, but also to let people know that we exist and how to contact us, plus to raise some awareness and get people thinking about the value of birds of prey as we go around the state, and even out of state on occasion. The photos show the work donated by one of our donor/supporter companies, Cardinal Visual Solutions/Cardinal Manufacturing located in the Broad Ripple district of Indianapolis. The van displays our name, location and phone number; logos of our supporting groups that made the van possible, and photos of some of our resident birds. A generous grant from the Brown County Community fund made this van possible. Follow our van to our new website! Cardinal Visual Solutions was a huge help in branding our van. We think that Cardinal did a great job, and thank them, along with Brown County Community Foundation and our other sponsors, for their generosity! Welcome to the new website for the Indiana Raptor Center! I’m so happy to be sharing it with the world, and I’d like to share a bit about its creation. My name is David Orr, and I worked with my wife Jennie to build this new site for the people and the birds of InRC. The process that brought us to this day took months, beginning with research and rethinking of the site’s structure, a phase largely guided by Jennie’s intuitive feel for usability and navigability and her sharp critical eye. We looked at dozens and dozens of other sites in the field of wildlife care to see what they did well and not so well. We seriously evaluated what improvements we could make to InRC’s old site to make it work with today’s rapidly evolving web. Our first goal was to craft a site that worked perfectly on smartphones and other mobile devices. Not only are smartphones becoming more popular in browsing the web, it’s likely that someone who is in immediate need of a wildlife rescue organization would be using a phone to find help: standing on the side of the road near an injured bird, unsure of what to do, the path to speaking to a wildlife rehabilitator should be quick and free of obstruction. Second, InRC needed the site to more prominently serve as a way to seek donations. Contrary to popular belief, they receive no public money to do their work and depend on the generosity of donors. Finally, the site needed an aesthetic makeover focusing on fulfilling the first two goals. Since the first two goals hopefully speak for themselves through the functioning of the site, I’d like to write a bit about my aesthetic choices. The work InRC does is hands-on, intimate, and personal. I decided to take a similar approach with the site’s visual design. A hand-made, somewhat rustic, personal look inspired by printmaking seemed like a promising way forward. To that end, the new header graphic incorporates the InRC “eagle and cabin” logo in the style of a woodblock stamp. The fonts I picked out for the header and other headlines on the site also fit this printmaking-inspired direction. All of these fonts are digital translations of vintage wood type from the Hamilton Wood Type & Printing Museum, who have a local connection in their relationship with Indiana University School of Fine Arts and its famous typeshop. In expressing the unique personality and the heart and soul that makes InRC special, this collection of fonts seemed to fit the bill perfectly. The color scheme, nicknamed “Kestrel” for the little falcon that inspired it, was similarly thought out. Its palette of teal, steely blue, orange, yellow, and tan isn’t too serious, and is flexible enough to allow a variety of color combinations on a spectrum from more to less playful. The “kestrel” color scheme and headline fonts chosen for the new website design. While the work of InRC is often heartbreaking, I am continually impressed by the playful, joyous personality that persists among the staff. I’ll never forget my very first meeting with Laura Edmunds, in the fall of 2011. Jennie and I were visiting InRC as I hoped to take photographs for my first project as a graphic design MFA candidate at IU. We drove out to the hills of Nashville, knocked on the door, and were greeted by a woman who said were were just on time for our tour of the pickle factory. The sharper of the two of us, Jennie still thinks it’s hilarious that Laura duped me into a bashful apology. While I don’t have the particular skills and knowledge to directly rehabilitate injured birds, I have tried to express the personality of the organization, guided by my own love of raptors, with this site. Thank you for reading and here’s to many more years of success to InRC! If you’ve found your way here, please rest assured that we’ll be putting the final touches on this new site soon.